This post is part of a multi-post series on web application security threats and their solutions. Please visit my introduction article here to know about more security threats and their solutions. This type of attack enables attackers to inject client-side script into web pages viewed by other users. XSS flaws occur whenever an application takes untrusted data and sends it to a web browser without proper validation and escaping. XSS allows attackers to execute scripts in the victim’s browser which can hijack user sessions, deface web sites, or redirect the user to malicious sites. According to WhiteHat security Statistics report, approximately 65% has XSS security issues. Suppose we are developing a page as follows. Let’s consider this common scenario where user can enter name and email Id. And on click of Signup button click a personalized response welcoming user, is displayed. The problem is, oftentimes that string in the thank you message is just the input data directly rewritten to the screen. in the email id field. Then the output of the above code will execute the script and will result in displaying an alert pop-up box on the web page which was not the desired behavior. This is a small example what a hacker can do with XSS attack. The hacker can also use such holes to redirect a user to unwanted sites too. There was no expectation set as to what an acceptable parameter value was. The application took the parameter value and rendered it into the HTML source code precisely. It trusted that whatever the value contained was suitable for rendering on the page. There was no sanitation of data output while displaying on the web page. Request validation is the .NET framework’s native defense against XSS. By default, it is turned ON. Unless explicitly turned off, all ASP.NET web apps will look for potentially malicious input and throw the error above along with an HTTP 500 if detected. So without writing a single line of code, most of the XSS exploits would never occur. It’s an effective but primitive control which operates by looking for some pretty simple character patterns. But what if one of those character patterns is actually intended user input? What if a user is inputting data in rich HTML editor control? In such cases, we can turn off the validation within the page directive of the ASPX. Alternatively, request validation can be turned off across the entire site within the web.config. But this is not a smart idea unless there is a really good reason why we’d want to remove this safety net from every single page on the site. Another essential defense against XSS is a proper use of output encoding. The idea of output encoding is to ensure each character in a string is rendered so that it appears correctly in the output media. For example, in order to render the text in the browser we need to encode it into <i> otherwise it will take on a functional meaning and not render to the screen. A fundamental difference between the encoding performed by Anti-XSS and that done by the native HtmlEncode method is that the former is working against a whitelist whilst the latter to a blacklist. The whitelist approach is most of the time a more secure route. Consequently, the Anti-XSS library is a preferable choice even for HTML encoding. Using an encoding library like Anti-XSS is absolutely essential. The last thing you want to be doing is manually working through all the possible characters and escape combinations to try and write your own output encoder. It’s hard work, it quite likely won’t be comprehensive enough and it’s totally unnecessary. One last comment on Anti-XSS functionality; as well as output encoding, the library also has the functionality to render “safe” HTML by removing malicious scripts. If, for example, you have an application which legitimately stores markup in the data layer, and it is to be redisplayed to the page, the GetSafeHtml and GetSafeHtmlFragment methods will sanitize the data and remove scripts. Using this method rather than HtmlEncode means hyperlinks, text formatting, and another safe markup will functionally render (the behaviors will work) whilst the nasty stuff is stripped. The Anti-XSS product has another good component called the Security Runtime Engine (SRE). This is essentially an HTTP module that hooks into the pre-render event in the page lifecycle and encodes server controls before they appear on the page. You have quite granular control over which controls and attributes are encoded and it’s a very easy retrofit to an existing app. To successfully restrict valid data for your Web pages, you should limit the ways in which the input data can be represented. This prevents malicious users from using canonicalization and multi-byte escape sequences to trick your input validation routines. A multi-byte escape sequence attack is a subtle manipulation that uses the fact that character encodings, such as uniform translation format-8 (UTF-8), use multi-byte sequences to represent non-ASCII characters. Some byte sequences are not legitimate UTF-8, but they may be accepted by some UTF-8 decoders, thus providing an exploitable security hole. 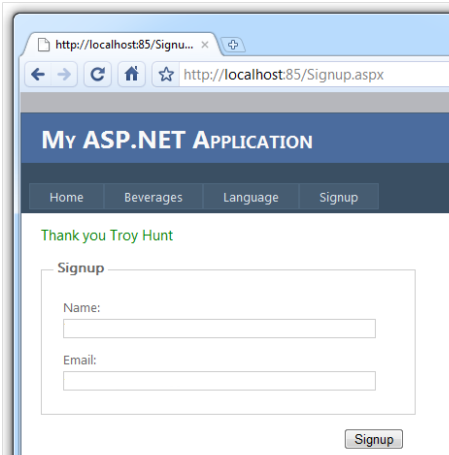 ASP.NET allows you to specify the character set at the page level or at the application level by using the <globalization> element in the Web.config file. The following code examples show both approaches and use the ISO-8859-1 character encoding, which is the default in early versions of HTML and HTTP. To set the character encoding in the Web.config file, use the following configuration. Hope you will find it helpful. Please stay tuned for more articles in this series in introduction article here. This type of attack enables attackers to inject client-side script into web pages viewed by other users. XSS flaws occur whenever an application takes untrusted data and sends it to a web browser without proper validation and escaping. XSS allows attackers to execute scripts in the victim’s browser which can hijack user sessions, deface web sites, or redirect the user to malicious sites. According to WhiteHat security Statistics report approximately 65% has XSS security issues. Then the output of the above code will execute the script and will result in displaying an alert pop-up box on web page which was not a desired behavior. This is a small example what a hacker can to with XSS attack. The hacker can also use such holes to redirect user to unwanted sites too. But this is not a smart idea unless there is a really good reason why we’d want to remove this safety net from every single page in the site. Another essential defence against XSS is proper use of output encoding. The idea of output encoding is to ensure each character in a string is rendered so that it appears correctly in the output media. For example, in order to render the text in the browser we need to encode it into <i> otherwise it will take on functional meaning and not render to the screen. One last comment on Anti-XSS functionality; as well as output encoding, the library also has functionality to render “safe” HTML by removing malicious scripts. If, for example, you have an application which legitimately stores markup in the data layer, and it is to be redisplayed to the page, the GetSafeHtml and GetSafeHtmlFragment methods will sanitise the data and remove scripts. Using this method rather than HtmlEncode means hyperlinks, text formatting and other safe markup will functionally render (the behaviours will work) whilst the nasty stuff is stripped.